From early April Yellow Wagtails arrive in the Netherlands. Flava and flavissima are breeding birds in the Netherlands. M. f .thunbergi is a migrant that breeds in Scandinavia. M. cinereocapilla is a vagrant and has became a species with M. c. cinereocapilla, M. c. iberiae and M. c. pygmae as subspecies. The other (sub)species in the plate below are potential vagrants and even the more eastern (sub)species should always be taken into consideration. M. f. flava – blue-headed wagtail. Blue-grey head with white supercilium and malar stripe in males. Normally a yellow throat but can have some white on the chin but white does not extend onto the neck like in M.f.beema. S Scandinavia W to France and C European mountain ranges E to the Urals. Winters sub- Saharan Africa. M. f. flavissima – yellow-crowned wagtail. Yellow-green head with a brighter yellow supercilium. Yellow only on the forehead not such extensive as in M. f. lutea which also has a yellow neck. Ireland (intermittently), Britain & adjacent coastal Europe. Winters Africa. M. f. thunbergi – dark-headed wagtail. Head dark blue/grey to almost black, reaching down to the cheeks, yellow throat and now eyebrow. Can have a minor white malar stripe. Dark headed males can look closely to M.f.feldegg but neck and mantle are less contrasting in M.f.thunbergi. C & N Scandinavia & N Estonia E thru Siberia to the R Kolyma. Winters mainly sub- Saharan Africa, possibly NE Africa and across S & SE Asia. M. f. plexa (form) – north Siberian yellow wagtail Males like M. f. thunbergi but ears darker, top of head lighter, vestigial supercilium. M. f. cinereocapilla – italian wagtail. Dark blue head with only small hint of an eyebrow behind the eye. Italy, Sardinia, Sicily, SW Slovenia & NW Croatia. Winters along Mediterranean coast and Mali E to Lake Chad. M.f. iberea - iberian wagtail. Dark blue head, white throat and clear white eyebrow. Iberia, SW France and NW Africa S to islands of Banc d’Arguin (Mauritania). Winters W & NC Africa. M.f. pygmaea - egyptian wagtail. Simular to M. f. cinereocapilla but smaller. Nile valley & NW Sinai (Egypt). M. f. feldegg – black-headed wagtail. Like M. f. thunbergi but black cap in males, yellow throat strong contrasting line between black in the neck and brown/green mantle. Bulgaria, S Romania, S Slovenia, W Croatia, Bosnia, S Serbia, Albania, Macedonia, Greece & Crete NE to S Ukraine and E to Turkey, E Mediterranean, Iraq, W Caspian, Iran, Afghanistan & S Kazakhstan E to L Balkhash, Lake Alakol and adjacent N Xinjiang (China). Winters mainly Nigeria E to Sudan and S to Uganda, Rwanda, Burundi & N DR Congo. M. f. melanogrisea (form) – turkestan black-headed wagtail Similar to M. f. feldegg, but white malar stripe and more green than brown neck/mantle. M. f. lutea – yellow-headed wagtail Head yellow with green neck in males. Head pattern less marked as in other wagtails. Reminds on male Citrine Wagtail. SW Russia between lower R Volga and R Irtysh and N Kazakhstan E to L Chany & L Zaysan. Winters Africa & Indian subcontinent. M. f. beema – Sykes' wagtail Like M .f .flava but head lighter grey, ears washed white. Upper R Volga E to SW Siberia and S to N Kazakhstan & Altai Mts and Ladakh & possibly also N Kashmir (W Himalayas). Winters mainly Indian subcontinent also Arabia & E Africa. M. f. leucocephala – white-headed yellow wagtail. Male like M. f. flava, but grey of head very pale, almost white. NW Mongolia, N Xinjiang (extreme NW China) and adjacent parts of far eastern Russia. Winters in India probably. NE Siberia and N & W Alaska & extreme NW Canada. Winters mainly SE Asia E to Philippines & S to Indonesia. M. t. angarensis (form) – south siberian yellow wagtail. Males like M. t. tschutschensis, but supercilium more pronounced. 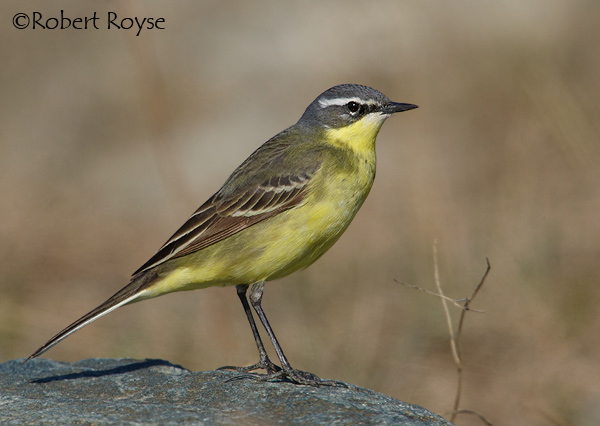 M. t. simillima (form) – bering sea yellow wagtail. M. f. flava, but supercilium usually less pronounced. M. t. zaissanensis (form) Like M. t. taivana but dark crown. M. t. taivana – green-crowned yellow wagtail Like M. f. flavissima but darker above, ears much darker, almost black. SE Siberia, Amurland, Sakhalin & N Hokkaido (Japan). Winters Myanmar, S China & Taiwan S to Greater Sundas, Philippines & Wallacea. M. t. macronyx – southeast siberian yellow wagtail. Males like M. f. thunbergi but brighter and more strongly marked overall. SE Transbaikalia E to Amurland and Ussuriland and S to NE Mongolia & C Manchuria. Winters SE Asia S to Malay peninsula & SE China.